Olive oil wins all the lime light for its flavor and goodness in your diet and health, but did you know that it ranks high even in beauty care? One of the most amazing facts is that it does the body good both inside and out. • To get frizz-free hair- Mix equal parts of water and olive oil and apply it on your shampooed damp hair and leave it for 20 minutes and rinse. • Get your nails and cuticles moisturized by applying olive oil on them. • Olive oil can heal those chapped lips. Add some sugar and make a great scrub and rub across your lips to provide moisture and shine to your lips. • Olive oil works wonders on the skin for reducing stretch marks, wounds, cuts, and acne scars. • Remove your make up by dabbing some olive oil with cotton on your face. • Add olive oil into your water bath for luxurious and soft skin, or you can also dab some oil on your damp skin after your bathe too. • Avoid those dry and flaky feet by using 1 tbsp of olive oil in a warm footbath and soak for 10 minutes, then pat dry. • Magic ingredients called antioxidants in olive oil promote faster re-growth and repair of hair, and delays the skin-aging process. What are you waiting for? 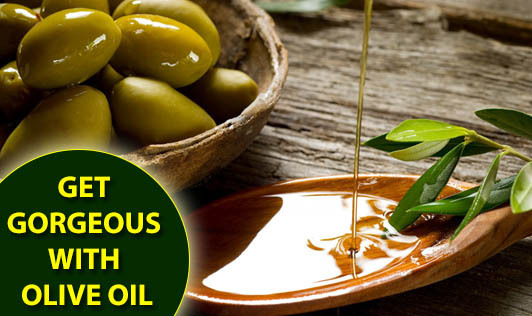 Flaunt your skin and hair this winter by using olive oil!!! !